Mechanical Testing - Metallurgical Technologies, Inc.
Tensile testing is the most fundamental type of mechanical testing on all metals, polymers, composites, and fabrics. A tensile test applies an axial load to a specimen past the yield point to failure. Test results provide many mechanical properties such as yield strength, ultimate tensile strength, elongation, reduction of area, and strain hardening behavior. We routinely test machined coupons, fasteners, wire, cable, tubes, pipes, plates, structural beams, or bars. We can machine your raw materials or finished products to standard or sub-sized coupons if necessary. We utilize an extensive variety of grips and fixtures to provide the tensile setup needed to complete your tests. 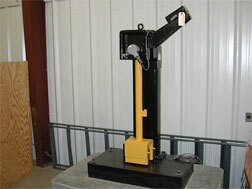 Our Tensile testing equipment is also fully capable of load testing. This is highly utilized during weld qualification and weld procedure testing and to support our Failure Analysis. Hardness itself is a material characteristic that can be altered in a variety of processes. Material hardness is defined as the resistance to indentation, and it is determined by measuring the permanent depth of the indentation. MTI routinely performs hardness testing on nearly every project that comes through our lab. Examples of hardness testing being performed can be found on our Case Studies page as well as our Weld Testing and Engineering. Rockwell hardness testing is the most commonly used hardness test method on larger sample. 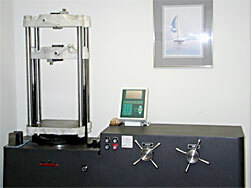 The Rockwell hardness test method measures the permanent depth of indentation produced by a force/load on an indenter. 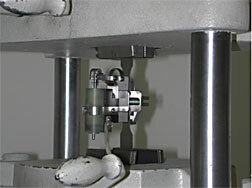 First, a minor preload test force is applied to a sample using a diamond or ball indenter. After the preload, an additional main load is added to reach the total required test load. This load force is held for a predetermined amount of time. At the completion of the testing, the depth of the indentation is measured and converted into a Rockwell Hardness value. Brinell hardness testing is most commonly it is used to test materials that have a grain structure that is too coarse to be tested using another test method (castings and forgings). Brinell testing uses a very high test load with a ball indenter to test a much larger area than a Rockwell test. Similar to the Rockwell test, the Brinell hardness test method applies a test load to a ball indenter which is held for a predetermined time period and then removed. The diameter of the resulting impression is measured with a specially designed Brinell microscope. The diameter measurement is converted into a Brinell hardness value using a specialized chart. Microhardness testing can measure a near surface hardness to core hardness on case-hardened parts to determine the effective case depth profile. Microhardness testing can also be used to identify metallurgical defects of conditions such as grinding burns or decarburization. Metallurgical Technologies, Inc. (MTi) offers Rockwell (standard or superficial), Knoop and Vickers Microhardness, Brinell hardness, and Shore hardness testing. The Charpy impact test, also known as the Charpy V-notch test, is a test which determines the amount of energy absorbed by a material during impact. Charpy impact testing involves striking a specially machined and notched specimen with a calibrated controlled weight pendulum swung from specific height. The standard Charpy-V notch specimen is to very precise dimensions prior to testing. The amount of energy absorbed in fracturing the test-piece is measured and this gives an indication of the toughness of the material being tested. 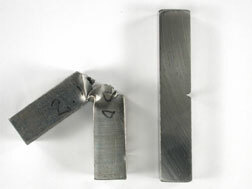 Charpy impact testing show whether a metal can be classified as being either brittle or ductile. This is particularly useful for ferritic steels that show a ductile to brittle transition with decreasing temperature. A brittle metal will absorb only a small amount of energy when impact tested; a tough ductile metal absorbs a large amount of energy. Charpy impact testing is also widely utilized during weld qualification and weld procedure testing.